If you're a fan of the Monster High series, and especially if you already have a MH doll collection, you'll want to check out these Create-A-Monster packs. They give you the parts to come up with your own creepy cool characters. Add some new dolls as background characters in your Monster High display, or in those youtube videos you put together. So far there are two "Starter Sets" and 3 "Add-On Packs". You will need one starter set for every doll you'd like to keep. There are certain parts that only come one per starter set, and aren't in the add on packs. The more sets you have the more combinations you can try to come up with your idea of the perfect monster. The Werewolf has light grey skin. The Dragon has peach skin with teal accents. The Werewolf and Dragon both use the same torso (which matches the Werewolf's light grey skin), long red wig with bangs, black, open-toed high-heeled shoes with a moon design, a black brush, and a black doll stand. You can mix and match all of the parts in this kit to create 250 different combinations. With only one torso you can only have one doll made for display per starter set. The werewolf would make a fabulous friend or family member of Clawdeen Wolf. The Dragon is one of a kind! The Vampire has light pink skin. The Sea Monster has blue skin. The Vampire and Sea Monster both use the same torso (which matches the Vampire's light pink skin), long black wig with purple highlights and bangs, black, open-toed high-heeled pumps with purple ankle cuffs, a black brush, and a black doll stand. You can mix and match all of the parts in this kit to create 250 different combinations. Again, with only one torso you can only have one doll made for display per starter set. The vampire would make a good friend or family member of Draculaura, and the Sea Monster for Lagoona Blue. The Three-Eyed Ghoul has blue skin. Note: To make a 3 eyed girl doll you need the torso, upper arms, and thighs from one of the Starter Sets. This is the first Backgrounder from the Monster High series to be made into a doll. Called "Triclops girl" by fans, she's seen wearing a similar dress and hat to this Add-On pack. The Monster High Facebook page had a contest to name the character and come up with her background info. Her name became Eyeris Polyphemus. Wonder if they'll work that into the show. The Insect has yellow and black skin. Note: To make a bee girl doll you need the torso, upper arms, and thighs from one of the Starter Sets. The Monster High Facebook page had a contest to name this character and come up with her background info. The winning name was Beeanna, daughter of The Hornets. We'll have to wait and see if she becomes an animated character. The Sketeton has white bones. Note: To make a sketeton girl doll you need the torso, upper arms, and thighs from one of the Starter Sets. The Monster High Facebook page also had a contest to name this character and create her bio. Meet Skelly Bones, daughter of Charon the Ferrier, guardian of the underworld. There have been a few skeleton boys as backgrounders, but I don't think we've see a skeleton girl yet. 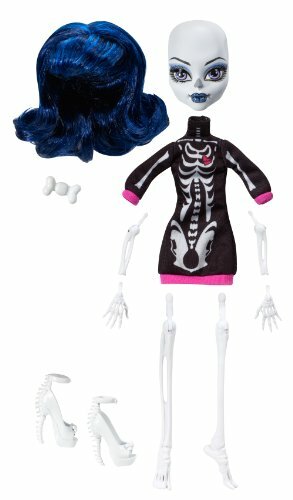 Design your own Monster High ghouls! Select a torso, set of limbs, and a head from the Create-A-Monster kits, place them in the Design Lab, and apply tattoos which range from spider webs to stitches and more. There are endless combinations to come up with your own perfectly imperfect Monster High characters. Monster High Fans Say Hello!